GrayLight | William McCormack Place Stage 2, Cairns. William McCormack Place Stage 2, Cairns. 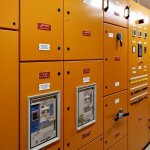 Building Services Electrical Engineering by Carl Gray for MGF Consultants (NQ). 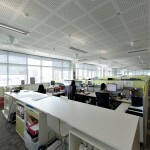 Mechanical services by Graeme Standfield and Sonia Holzhimer for MGF Consultants (NQ). Structures, fire engineering, and wind by Arup. Architecture by Cox Architecture and CA Architects. 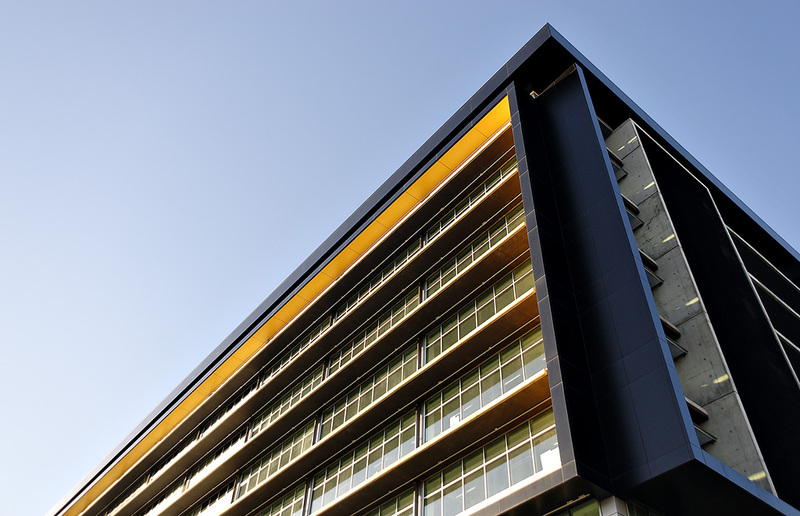 William McCormack Place Stage 2 (WMP2) is a 10,000m² office building for the Queensland Government located in Cairns, Far North Queensland. The design of WMP2 combines existing best practices with a number of innovations to reduce its environmental impacts and improve indoor environment quality for the building’s users. WMP2’s design is predicted to reduce energy/emissions by approximately 60% and reduce potable water use by 75% compared to a median office building. 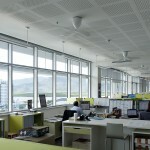 And at the same time it provides a healthier work environment, with tenants benefiting from improved air quality, daylight, and high-comfort electric lighting. Green Star innovation (4 innovation points awarded). The structures and architectural team worked closely with the services disciplines to ensure that the post-tensioned slab system provided workable and future-proof riser arrangements. 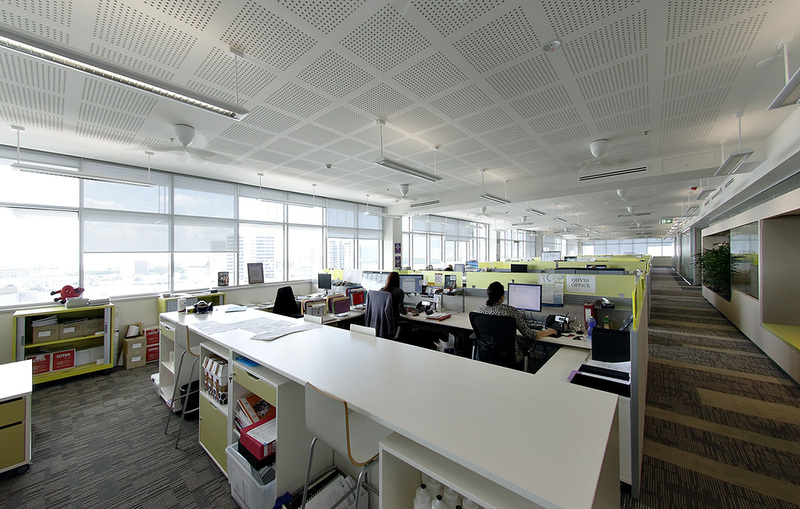 Lighting specialists worked with the architect to optimise shading, glazing, and finishes to provide effective daylighting for all open-plan office areas. An innovative approach to daylight-harvesting controls was developed, designed to be more effective and acceptable than traditional systems. 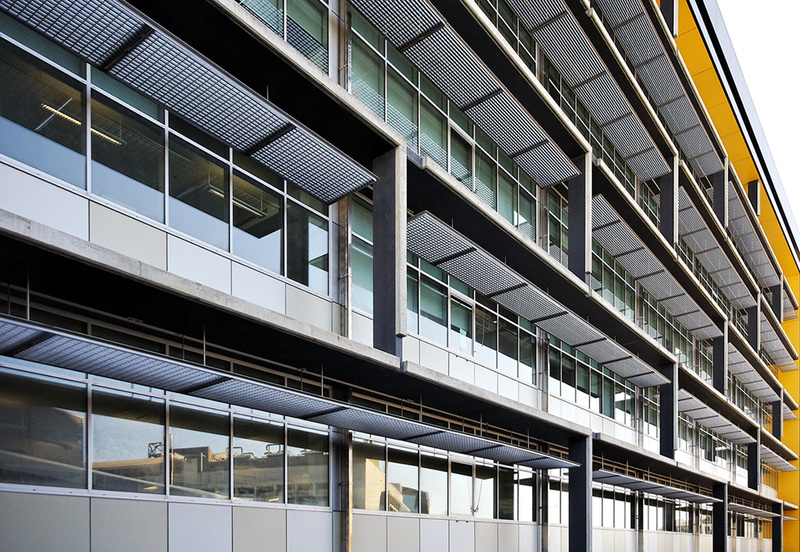 Glazing and shading systems also incorporated expert wind engineering advice for optimum daylighting, comfort, and sealing of the envelope; while also incorporating Safety in Design principles using the shading system as maintenance access. Lighting/electrical and mechanical engineers proposed an interior form and servicing arrangement which the architect accepted and developed. 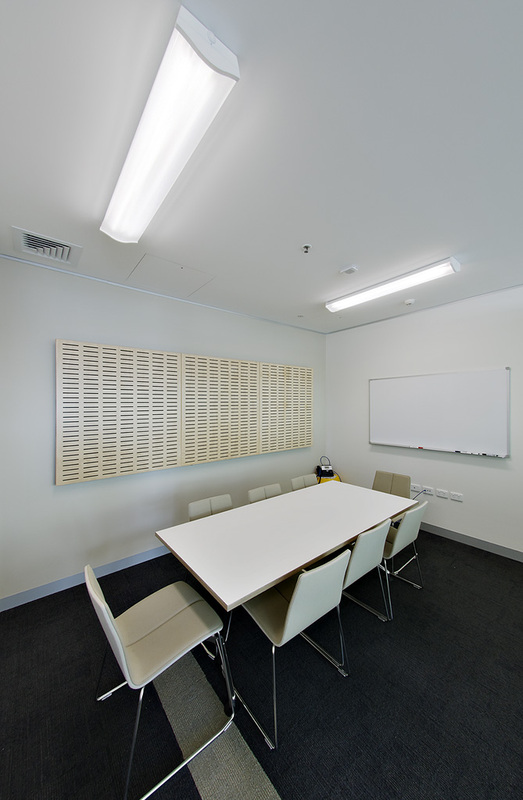 High ceilings and window-heads throughout an 8m deep open-plan perimeter zone provide excellent daylight while ‘rib’ bulkheads provide air distribution and services access, and dropped ceilings through the ‘spine’ provide main services and a built zone. 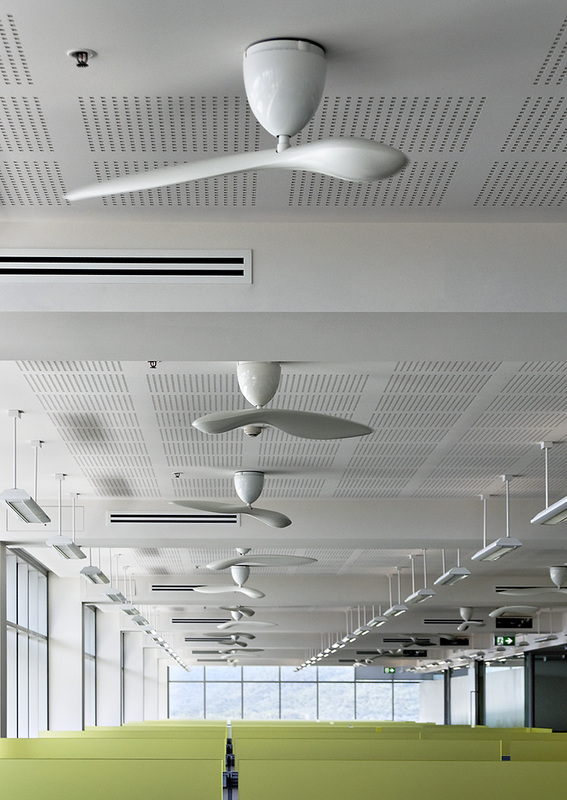 Mechanical and electrical engineers utilised high-efficiency low-noise ceiling fans to assist air conditioning in cooling building occupants, and improve air mixing. 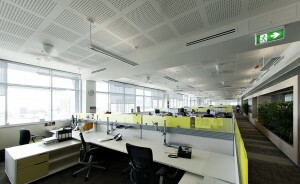 This also enabled simplified zoning of air-conditioning which reduced ductwork quantities. 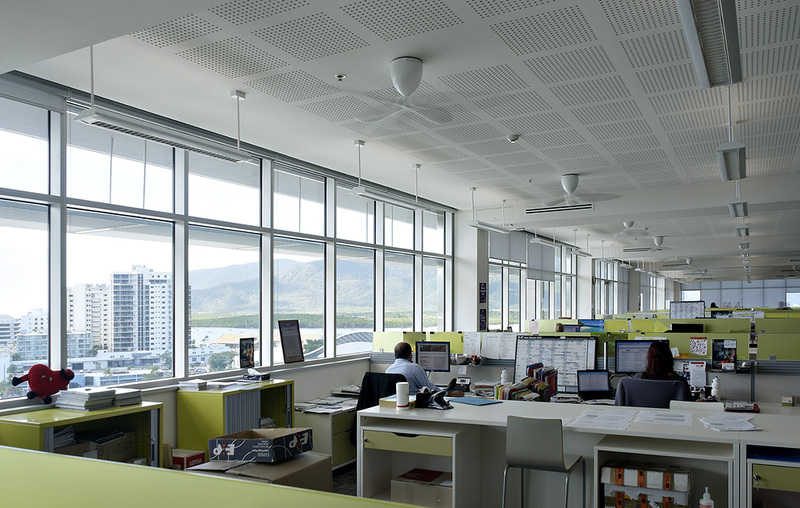 Lighting/electrical engineer worked with manufacturers to develop a flexible control solution which integrates these fans to both lighting and air conditioning systems. 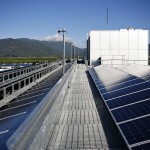 Electrical engineers in collaboration with the structures and architectural team designed 64kW solar photovoltaic generation and accommodated telecommunications services on the rooftop with a minimum number of roof penetrations, while also providing safe access to these and withstanding cyclonic conditions. 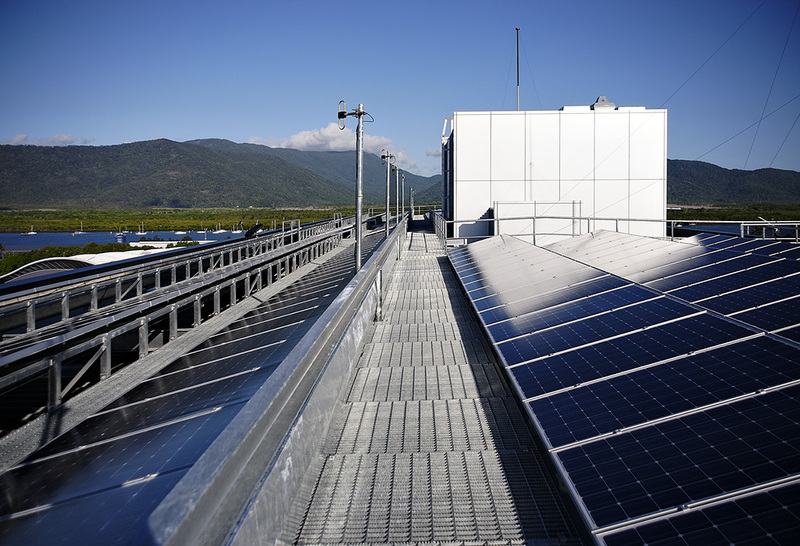 Hydraulic engineers provided a contingency design for a ‘smart’ rainwater roof wash-down system (under the solar panels – though this was ultimately not needed). Hydraulic and electrical engineers collaborated with landscapers to develop a ‘smart’ irrigation control system which uses landscape irrigation as a method of disposing of treated grey water – significantly reducing water to sewer. Grey water collection includes around 170,000 litres per year of condensate water from air-conditioning. 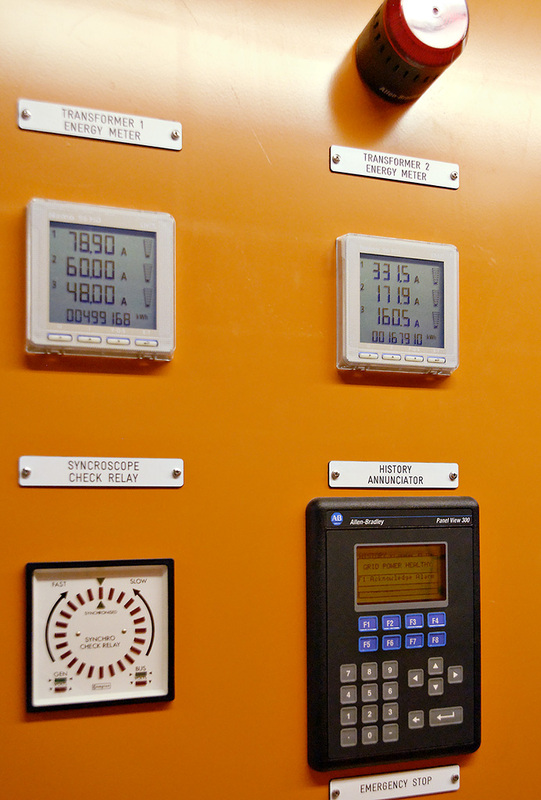 All services consultants coordinated a large number of interfaces between the Building Management System (BMS) and various sub-systems for centralised control and management via the BMS. 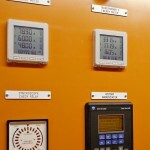 This includes all time scheduling, sub-metering of all energy and water; and fault reporting on all systems. The key design and engineering solutions implemented on this project along with other engineering initiatives have assisted in delivering the WMP Stage 2 project on budget and ahead of schedule. 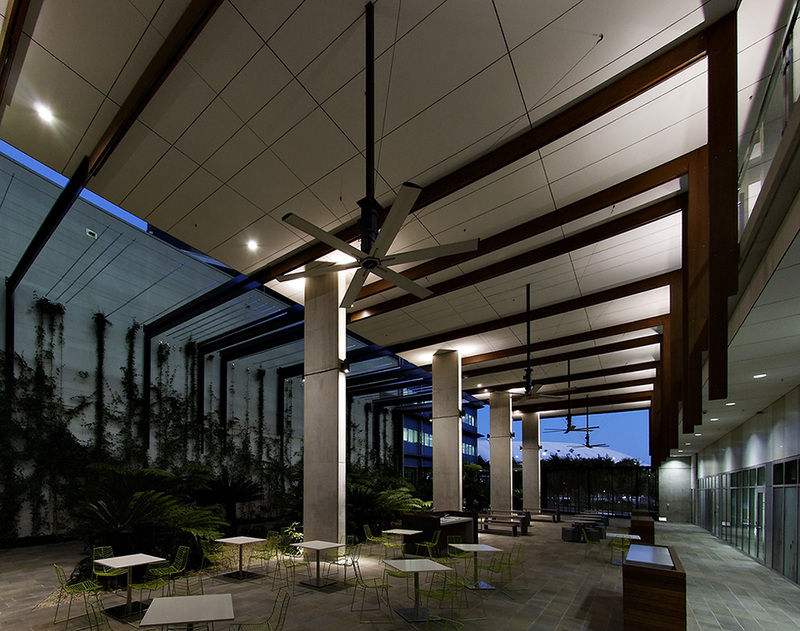 The building’s energy saving initiatives were projected to deliver approximately $450,000 per year in cost savings to Queensland tax-payers. 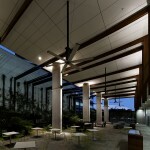 The design was also projected to deliver an impressive suite of environmental outcomes. 4 Star NABERS Water rating (Stage 1 & 2). 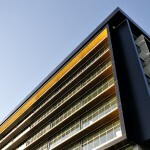 Shading on each facade is optimised to its orientation. 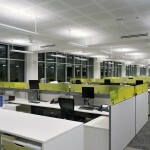 Direct-indirect lighting provides for high levels of visual comfort and performance. Reliable backup power is provided. High levels of daylight (and excellent views) are provided. 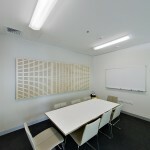 Meeting rooms and private offices are located in designated ‘built zones’ along the centre of the floor plate. 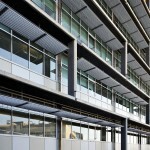 External shades also provide for maintenance access. 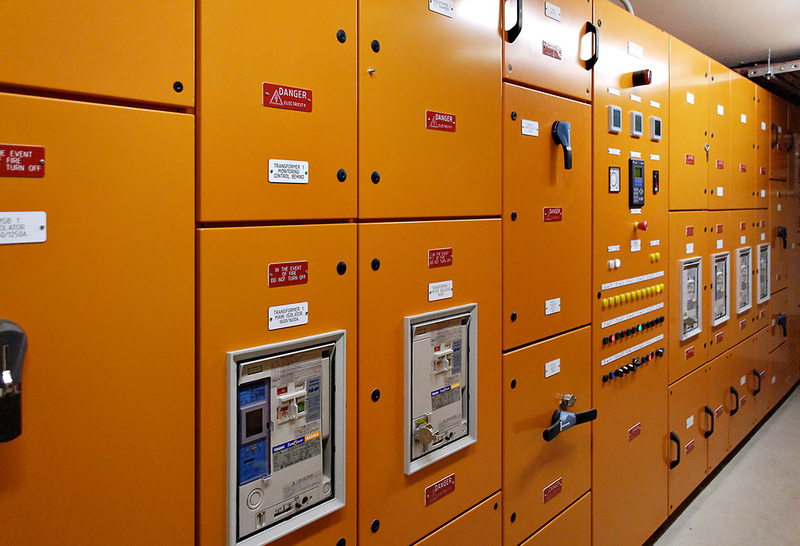 Power quality is closely monitored. 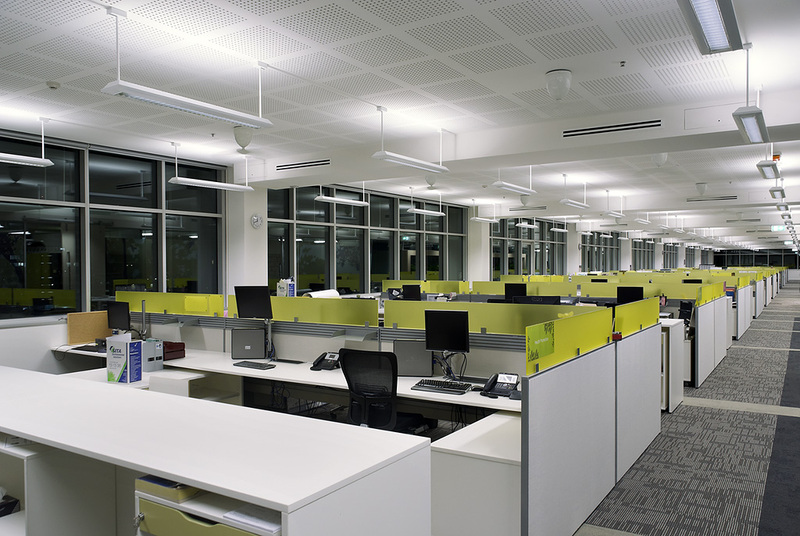 Suspended direct-indirect lighting uses novel daylight harvesting controls, but patches of light on the ceiling retain the sense that ‘the lights are on’. Each ceiling fan throughout the office space are controlled by a novel DALI addressable device. 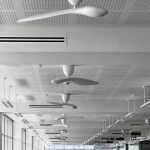 The open air foyer with HVLS fans avoids the need for excess conditioned space.